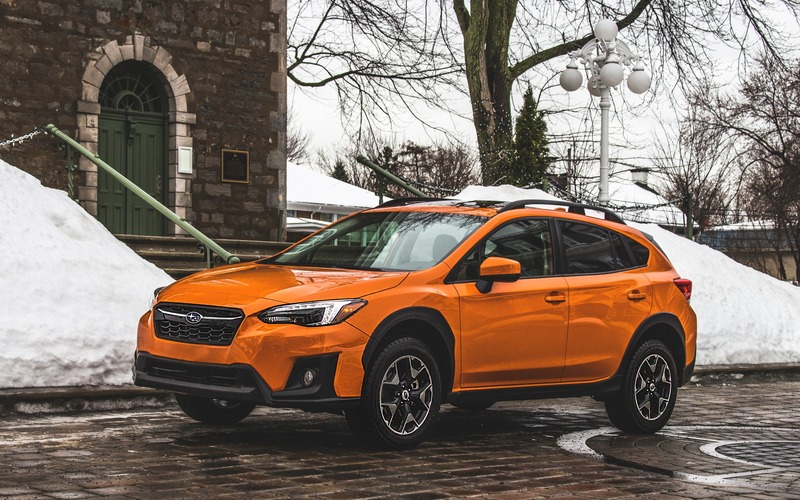 When I scheduled the 2018 Subaru Crosstrek for testing, Subaru Canada offered the choice between two vehicles, the one with the manual transmission, or the one with the continuously variable automatic transmission. Obviously, the market being what it is means nobody’s driving manuals these days. But the Crosstrek is aimed at young, active, outdoorsy types of individuals, who presumably don’t eat gluten, crave the high-protein regiment, are addicted to hard training sessions and take pleasure suffering from aching muscle pain as they get out of bed in the morning. And these overachieving individuals prefer driving stick. Of course, what I wrote up there makes absolutely no sense at all. 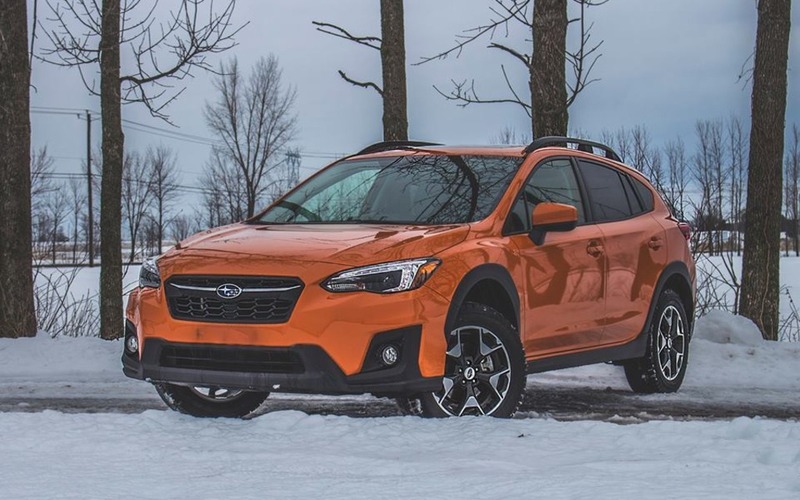 However, factually, there are benefits of owning an all-wheel-drive utility vehicle with a manual gearbox, and the Crosstrek thankfully sits among the only available examples of the breed. If you enjoy controlling your vehicle yourself, you’ll probably appreciate the manual to rock yourself out of the clutches of a snowbank. Conveniently, while I had the Crosstrek, my neck of the woods was hit with two consecutive snowstorms, as well as some light rain in between, something we like to call: a cocktail from hell. Thankfully, my Subaru was bright orange, so everyone saw me coming through the blizzard. For 2018, the Crosstrek, which competes in the subcompact crossover segment, but is actually a lifted Impreza with body cladding, receives a major overhaul. Being based on the Impreza means it inherits Subaru’s all-new Global Platform, which, according to Subaru, is stiffer, quieter, safer and more refined in every way. 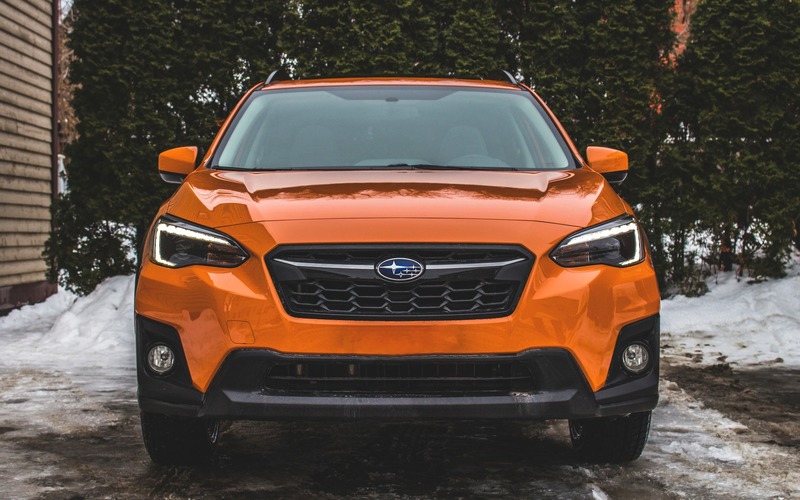 Styling also underwent a facelift, with now thinner LED headlights, a revised grille and bumper treatment as well as a reworked rear end, giving the Crosstrek an overall sportier and more youthful appearance. Being myself a “young,” “trendy” and “active” single male, I can attest that the Crosstrek looks very cool. Under the hood, the Crosstrek receives, again, important revisions. The 2.0-litre flat four remains, however it now inherits direct fuel injection and a bump in compression ratio (from 10.5:1 to 12.5:1). The result is a slight increase in power; 152 horsepower versus 148 in the 2017 model. Torque remains unchanged at 145 lb.-ft., but happens 200 rpm lower in the powerband. All Crosstreks come with the same engine, and there’s no turbo option. With a claimed 0-100 km/h acceleration time of 9.2 seconds, the Crosstrek isn’t all that quick. Being a Subaru means all-wheel drive is obviously standard, something its competition can’t exactly brag about. A continuously variable automatic spans the entire lineup, while the stick is available on Convenience, Touring, and Sport trims only. My tester was the Sport, which came with a sunroof, LED steering responsive headlights and a larger eight-inch (versus 6.5 inches) infotainment system screen. First impressions behind the wheel of the 2018 Subaru Crosstrek is that it is in fact much quieter than its predecessor, but still needs improvement. The Boxer engine makes cool sounds, especially as it climbs the tachometer, but remains buzzy upon cold starts and awkwardly revs at 3000 rpm on the highway, even with an added sixth gear (new for this year). In that respect, the CVT, which I drove in the Impreza, does a better job at quelling drivetrain hum and improving fuel economy. That being said, I still managed to hang around the 9 L/100 km average consumption mark. For an all-wheel-drive vehicle, in winter, that’s excellent. It’s the same story for wind and tire noise. It’s improved, allowing the cabin to be a much more serene place to spend some time in. This is arguably the best compact Subaru platform to date. But there are quieter tiny crossovers out there. I’m thinking about the Honda HR-V and Nissan Qashqai. However, and that’s a very important element, the Crosstrek is actually fun, enjoyable, spirited, and possibly the only subcompact crossover out there, except perhaps the Mazda CX-3, that drives like a tiny hatchback. The car is nimble and compact, making it supremely enjoyable to carve through traffic. Road composure is surprisingly well-mannered, with minimal body roll, even with 220-mm ground clearance. That lifted stance also helps the Crosstrek carve itself out of tricky situations. During a winter storm, you’ll feel like a hero in one, as if nothing can stop you. Subaru’s symmetrical all-wheel-drive system, combined with the Boxer engine, remains a no-brainer as far as traction goes, and counts itself among the best ones on the market. Hit the throttle a little too hard when turning at a snow-covered intersection and the car amusingly wags its tail. If that’s not your thing, don’t worry, Subaru’s stability management system will correct your line in a jiffy. But if you like driving, just remove it at the push of a button. Sure, there’s still a veil of electronic modulation, preventing you from becoming Ken Block during your snow-bound adventure, but Subaru engineers have given the system enough bandwidth to allow a bit of playtime. In other words, the Crosstrek still has a soul. The Orange Stitching Matches My Crossfit Shoes! Inside, the Crosstrek, just like the Impreza, gets an entirely revised cabin, which includes a redesigned dashboard and a significant improvement in build quality as well as the materials used. There’s fake carbon fibre, cool orange stitching which—in this case—matches the car’s exterior hue, and two-tone half leatherette, half fabric sport seats which look fantastic, but aren’t exactly the best fit for large-framed individuals. As I said: aimed at active people. The Crosstrek Sport also gets the latest version of Subaru’s Starlink infotainment system. It’s arguably one of the best ones of the industry thanks to a clean, simple and easy to comprehend layout. Icons are large and easy to find, and redundant physical controls are handy when wearing a pair of gloves. At last, the system features Apple CarPlay and Android Auto connectivity. All in all, the 2018 Subaru Crosstrek is fun, cheerful, well put together and more importantly, unquestionably cool. Sure, it’s not the quickest or more sophisticated subcompact crossover out there, but it’s affordable, competent, practical and immensely enjoyable to drive, especially with the manual gearbox. Carmakers often rant about the target clientele their cars are aimed at, but don’t often hit the mark. The Crosstrek does. Like a pair of Asics training shoes, the Crosstrek gets the job done, and like your fit body, it’s ready to take the hits. 8/10	We managed a 9.0 L/100 km average, in winter. For an all-wheel-drive car, that's excellent. 6/10	The cabin itself is roomy and so is the rear bench, but those sport front seats feel a tad cramped. 4/10	The Crosstrek is slow, no matter which transmission you choose. 9/10	Clean, simple, easy to understand and integrates Apple CarPlay / Android Auto. 8/10	Tight, nimble chassis, precise steering, slick manual gearbox, very fun to drive! 8/10	A charismatic subcompact crossover that charms its owners through competent all-weather capability, a practical body and an efficient engine, all at an affordable price.